Do you want to save money on your air conditioning bills, at the same time as enhancing your privacy and potentially prolonging the lifetime of your soft furnishings? Answer yes to one or more of these considerations and interior vinyl films could be the perfect option. We are a professional window tinting company that provides and fits premium films, tailored to achieve whatever is required – from enhanced security through to better productivity, there are numerous advantages to opting for commercial and residential window tinting. We partner with all industry leaders to bring you the best Long Island window tinting on the market. Our products are professionally installed by our authorized, factory-trained Long Island installers. Since we do not use subcontractors, we can ensure our employees will deliver the highest quality window tinting service. Have You Considered a Privacy Window Film? An economical method of providing privacy from prying eyes, a window tint is just the thing to protect your workers or family from unwanted scrutiny. We are able to install the business or home window tinting you need in order to have your privacy protected. Our team uses top-grade, 3m window film, as well as having a variety of other films on offer, if preferred. An added advantage of a privacy film is the reduced glare from the sun, helping occupants of the interior to be more comfortable. Not only can your film help with energy bills and provide welcome relief from the sun’s rays, it can also be a valuable security device. Ideal for use as a security or graffiti protective film, the right type of film will also hold firm in the event that glass from the window is shattered for any reason. Our film is created by well-known manufacturers (for example Solyx window film), ensuring that every customer receives a premium product that provides excellent results. Solar Solutions provides businesses & other commercial enterprises in New York with window tinting. 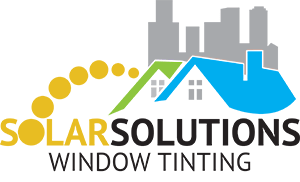 Solar Solutions strive to make your Long Island home or business a more efficient place with the largest selection of high performing window films tinting. Besides having a beautiful appearance that can immediately add interior comfort to any Long Island home or office, window tinting can also offer privacy. Furthermore, because window tinting helps block out heat in the summer, you’ll save money on your energy bills. In fact, tints and films often keep a building cool enough that air conditioning might not be required. This has your business running smoothly and helps you make the most of your resources. Choosing window tinting for your Long Island Commercial building also results in less glare. Glare is not only unattractive, but it can distract your employees or interrupt their work. Our solutions will ultimately bring greater comfort to your office. Our window film services can also benefit New York homeowners. Save energy and make your Long Island home more comfortable with solar control films. Solar Solutions’ window tinting can defend you and your family from UV rays, as well as your Long Island home’s furnishings from being faded by the sun. Moreover, they can effectively protect you and your family should your window ever shatter. The products available at Solar Solutions also can create unlimited design possibilities for your home. Give your home’s interior that attractive layout you’ve been planning while avoiding unwanted glare from the sun. Long Island home and commercial window tinting can significantly help reduce energy consumptions and can lower interior temperatures by up to 15 degrees. You can also use window tinting for decorative purposes and to increase privacy, using decorative window film and privacy window tinting. We carry window security films for our clients in NYC and Long Island too. Decorative window films come in several patterns and shades and can easily be removed and replaced to update the style of the window in the future. They also serve to increase privacy using one way mirror films as well as other privacy window films. We have a large selection of stylish decorative window films and can create unique, custom designs in Long Island. Furthermore, we provide interior finishes, which are cost effective ways to enhance the look and feel of your home or office. We have a variety of decorative films in New York. Not only is our film highly practical, our decorative window film offers attractive visual appeal that can really add value to the look of your room. Available in a range of colors and styles, we are able to install your film perfectly, even where you have windows which are a challenging shape or size. To find out more about our selection of films, or for anything else, call us at (866) 995-0433 / (516) 599-0433 or (212) 599-0333. We furnish and install privacy film, decorative window film, and security & graffiti film in New York.